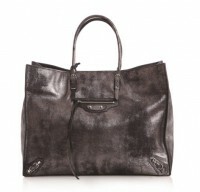 Chalk this up as another bag that needs to be seen in person to be appreciated. The Holiday 2011 sueded metallic finishes that Balenciaga has been parading around of late piqued my interest, but only the dark silver (Balenciaga calls it black, but whatever, it’s dark silver), because that just sort of how I roll. I was a little nervous because the Balenciaga 10th anniversary sueded bags weren’t my favorite by any stretch of the imagination, but upon closer inspection, the brand has definitely learned from that misstep. As we wait for Fall 2009 bag collection to slowly (really slowly) hit stores, some collections are bound to come out earlier than others. In the past few days, a number of new Burberry bags have been popping up around the Internet, so if you see a lot of them in the near future, that’s why. 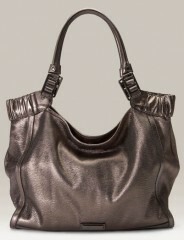 One of my favorites of the new crop is the Burberry Metallic Leather Hobo. It’s well-documented that dark silver or pewter is my favorite of all the metallics and probably my favorite neutral, and this is a great example. It has a great shimmer without being too shiny and over-the-top like lighter silvers can tend to be, and it would work well in any kind of weather. 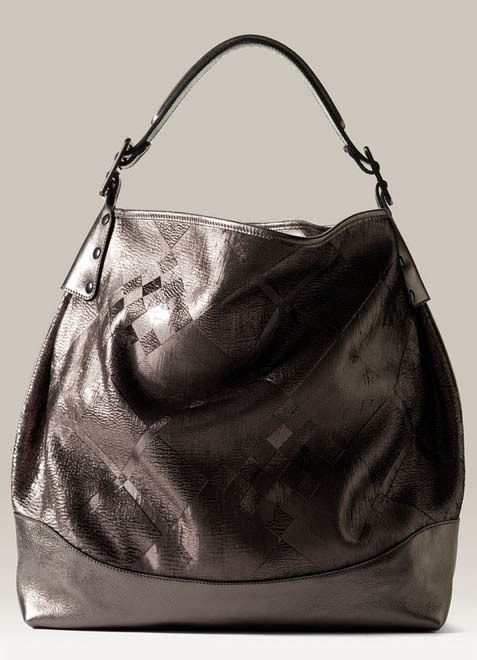 Also, I’m usually very anti-logo, but I think the way that Burberry subtly embossed their signature plaid into the soft leather is really creative – it gives the bag a bit of branding and visual interest all wrapped in one. If you’re looking for a slightly glam neutral for fall, I’d go ahead and pick this one up. Buy through Nordstrom for $1795. In general, I really don’t like so-called “neutral bags.” The leather has to be truly special, the design truly innovative and beautiful for me to look at one twice, and if it’s not, I bore really easily. My aversion is a result of the belief that there are so many bags out there made in so many beautiful colors, why would anyone choose one in a color that is supposed to, by definition, blend in and hide? But when I do like a neutral, that neutral is almost always some version of pewter or gunmetal, and the Burberry Metallic Leather Hobo is a great example of that color. It’s not a bright silver at all – it has a lot of grey in it, but enough shine and innate glimmer to make it decidedly glam and metallic. I can see it going with almost anything, but I can’t imagine it blending in and hiding at all, as the “neutral” moniker would indicate. So if you’re going to do something neutral, please do something with at least a LITTLE BIT of a kick. Buy through Nordstrom for $1795.